Most cryptocurrencies like Bitcoin are self-sovereign money. Meaning, they are to be held and taken care of by the owner only by design. And handing it to someone else is that’s why counterintuitive to the very reason they were conceived for. Because of this many crypto investors keep their Bitcoin and other cryptocurrencies in deep cold storage. While there are some careless ones also who keep them on crypto exchanges which are prone to crypto hacks !! But in any case, just holding your cryptocurrencies don’t increase your wealth. (except the price appreciation of the underlying asset). For example, if you hold 1 BTC which you bought for $2000, it may be $10,000 now, but your 1 BTC remains the same, it doesn’t become 1.15 or 1.25 BTC. But what if it could become? Earning interest on your bitcoins and altcoins wasn’t possible a few years back, but now with increased liquidity and recognition from investors around the world, this has become possible. It’s 2019 and crypto collateralized lending makes it possible for lenders (investors) to earn an extra buck on their idle sitting crypto capital. Moreover, this is in no way a new concept. The wealthy millionaires have been using this age-old method of making their money work for them by lending the extra capital they have in some form or other. In the traditional world, investors/borrowers usually use real estate or stocks or bonds to issue or get loans and accordingly do more with their capital holdings. Similarly, in the cryptosphere, anyone who has extra bitcoins or cryptocurrencies can lend it to the borrowers for earning a fixed rate of interest on their lendings. There are specially designed crypto lending, and borrowing services that are taking care of this complex process in a risk minimized way. We will get to those services in a second, but before that, it is essential to understand that this method works for both individuals and businesses, alike. The easiest way to start earning interest on your BTC or cryptocurrencies is by opening a crypto/Bitcoin savings account with crypto lending services. Opening a crypto lending/savings account with them will fetch you anywhere between 4-7% interest on your crypto holdings which is way too much than what you get from the banks. 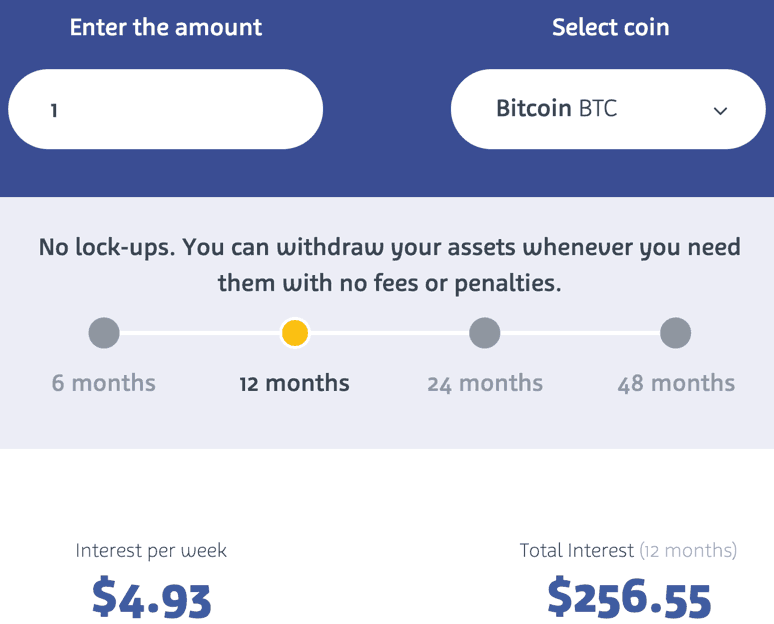 How Does This Interest On Bitcoin/Crypto Savings Account Is Generated? There is no rocket science in this business model. It is the same way banks operate. These crypto lending services take your deposits and lend it further to vetted borrowers at 10-16% interest rate and give you 4-7% interest from that share. The balance amount generated from the difference in the interest rate of lending and savings account is the profit margin of these crypto lending platforms. Moreover, your funds are only lent to vetted individuals or institutions against over collateralized assets of the institution or the individual just like crypto backed loans for borrowers. So this way you can expect to earn extra passive income on your idle sitting cryptoassets including BTC, ETH or other altcoins and stablecoins. To get started with this you just need to verify yourself on any of the above-listed platforms and complete your Bitcoin/crypto deposits. Once these funds are confirmed over the blockchain, they start accruing interest as per the agreed rate. Depending upon the platform you choose for your savings account and the type of cryptos you deposit along with the market conditions decide the interest rate you will receive. But there are services in the market that pay up to 7% interest on certain coins. Also, in terms of payment, these services differ a bit. Some services like BlockFi will pay you interest in the BTC or ETH depending upon what you have deposited. Celsius does the same, if you deposit BTC, you get the interest in BTC and ETH for ETH deposit. On the other hand there some like Nexo who like to pay in BTC for any kind of deposit you keep with them. And I guess, Nexo also does the same when you hold your stablecoins with it and they also pay dividends in BTC to Nexo token holders. Conclusion: Which is The Best Crypto/Bitcoin Interest Account? I think all these three crypto lending players are doing a fantastic job in serving the market and allowing investors/crypto holders to do more with their cryptoassets. But all three slightly differ from each other. When you compare in terms of interest rate offered and the flexibility of withdrawal of your deposits, Celsius wins over the other two brands. With Celsius, you get 7% APR for your stablecoin deposits, but when it comes to ETH and BTC, it is quite low. You will get around 3.15% APR for ETH and 5.10% APR for BTC deposits, calculated and distributed every Monday. 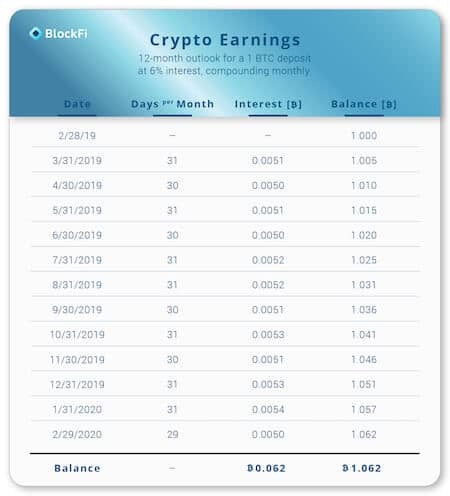 On the other hand, if you wish to deposit BTC or ETH, you should consider BlockFi because it offers a 6.2% APR on your deposits calculated and distributed monthly. But when it comes to withdrawal, you can expect the funds to be processed same day, but BlockFi reserves the right of up to 7 days to process withdrawals. Excess balance above 25 BTC: 2% APY The minimum balance to earn interest is 1 BTC. Accounts with balances greater than 1 BTC earn interest on the full balance. Excess balance above 500 ETH: 2% APY The minimum balance to earn interest is 25 ETH. Accounts with balances greater than 25 ETH earn interest on the full balance. Hope you liked this detailed article on earning interest on your cryptocurrencies. If you liked it, please do comment below, and we will strive harder to bring more such informative content for you in the future ! !